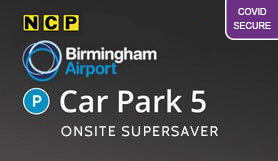 Located just 5 minutes away from the terminal, this long term parking option offers the convenience and security of an official on-airport car park in a value-for-money package. The parking compound has a high security fence around the perimeter, CCTV and twenty-four hour security patrols. This is a Non-Flexible booking. Dates and times can’t be amended. Only personal details can be changed such as your car registration and flight numbers. Number plate recognition in operation. Please wait for automatic ticket. If no ticket issued press for assistance.On your return insert ticket at exit for your booking to be validated. At the exit please insert your ticket for your booking to be validated. On entry to the airport follow the signs for Car Park 5.